After a great college football Saturday, the Backtime Editorial Department is on the bandwagon - but not with Kansas State, Notre Dame, Oregon, or even the indomitable Crimson Tide. Climb aboard with Louisville's Angry Birds: 9-0, with three to go. No I'm not trumpeting Louisville for a shot at the title. But an unbeaten season, capped by a BCS Bowl win over a formidable opponent would set the 2013 season up. Teddy Bridgewater is a true sophomore and will definitely be back (though questions linger about his coach), and the Cards can carry the torch for the reincarnated Big East Conference going forward. And again, I marvel at whomever takes these pictures. 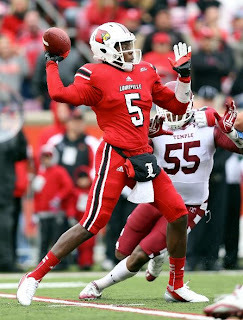 Bridgewater's throwing motion is flawless. He steps up in measured stride against the rush. His hand warmer and hand towel are perfectly dead center. His non-throwing hand says "stop" in diagonal symmetry like the cover of Van Halen's Diver Down. And the results are undeniable. 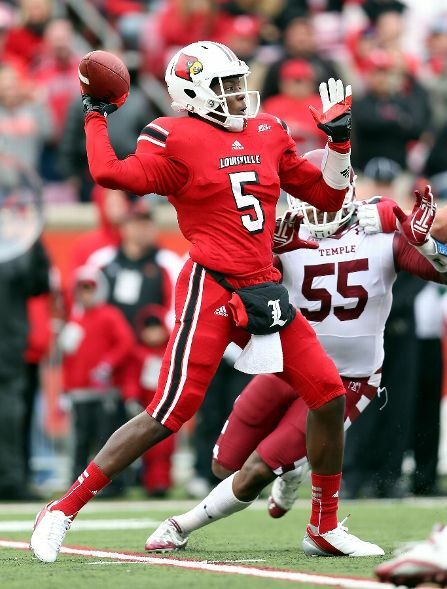 Bridgewater threw for 324 yards and 5 TD versus Temple yesterday, sharpening his already surgical season numbers: 70% completions, 9.5 yards/attempt, 18 TD and 4 INT. And he's not just a finesse passer. 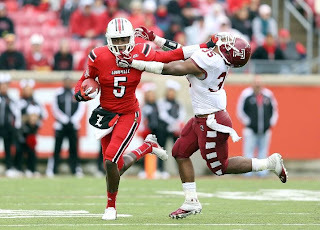 Bridgewater takes what he has to on the ground. And while he won't run many defenders over, he'll still deliver some punch. These are not just photo opportunities that this still-19-year old QB presents and very little has to do with luck. Unless we're talking about Andrew Luck.